China has recently started exploring the possibility of using their vast coal reserves to power their auto fleets. This is about the worst possible move China could make from an environmental perspective, and not very good from an economic perspective either. Coal-to-liquids (CTL) is another name for coal liquefaction, the process of converting solid coal into liquid fuels as a petroleum substitute that can then be used to power automobiles. China Daily recently reported that the Shenhua Group, China’s largest coal producer, opened it’s first coal to liquids processing plant in Inner Mongolia. The facility reportedly cost 10 billion yuan ($1.46 billion) and produces 1 million tons of fuel annually. What about the environmental footprint? CTL is a nightmare from an environmental perspective. Coal to liquids has the worst carbon footprint of any fuel. 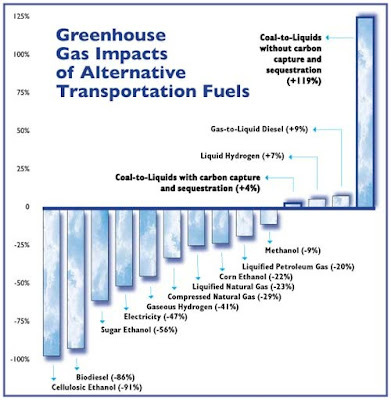 This graph below from the EPA sums up how shockingly bad CTL fuel is: more than twice as bad as regular gasoline. The line in the middle of the graph represents the CO2 emissions of regular gasoline. Even CTL with carbon capture and sequestration (CCS), a technology that is not proven, is 4% worse than regular gasoline. And just to drive home the fact that CTL are massive emitters of carbon, the Sasol CTL plant in South Africa is the single largest point source of CO2 in the world. According to an analysis by professors at Carnegie Mellon, CTL would need to sell for $63 per barrel to break even without CCS, and $78 to make an acceptable profit if it is produced using CCS (making CCS all the less likely). This translates into approximately $1.50 and $1.85 per gallon, assuming coal prices don’t rise. Shenhua also reports that they can produce CTL at $45 per barrel, possibly thanks to lower cost production or better technology. Adding a 15% profit margin to this results in a price per barrel in the low $50’s. In a world of high oil prices, this simple economic analysis seems to imply that it makes sense for coal-rich countries to start producing CTL fuel. But this is a bad deal when we start comparing this to the economics of an electric car. According to Deutsche Bank, a typical monthly contract that includes car, battery, and charging infrastructure with Better Place would cost $550 and include 18,000 miles per year. Let's compare this to the conventional car running on CTL: Morgan Stanley estimates that a new car from Detroit costs $500 per month and doesn’t include fuel, which at 18,000 miles per year would cost about $2,250 per month, even assuming that we paid the low price of $1.50 for CTL fuel produced without CCS. This is an all in cost of about $2,750. That’s a big cost advantage for electric cars. Why can electric cars actually be cheaper to run? Well, that’s due to their efficiency. The internal combustion engine is not an efficient source of power. In fact, according to Amory Lovins of RMI, only about 20% of the energy used in a gasoline powered car is used to turn the wheels- the rest is lost to heat or exhaust. By contrast, electric propulsion converts nearly 90% of energy into traction that turns the wheels. The economics for electric cars are looking better and better everyday. When you include the environmental benefits of electric cars, it’s becoming clear that electric is the future and alternative liquid fuels like CTL are just a distraction. I do think that the next big transportation revolution will come from China. Let’s just hope it comes from BYD, not Shenhua.